The Dunkirk Iron Works began the manufacture of geared locomotives with a short four wheel model having a vertical boiler and two vertical cylinders. These resembled the small number of four wheel, vertical boilered Class "A" models produced by the Climax Locomotive Works. The company's successor, Dunkirk Engineering Company, began production with a longer two truck, eight wheel model having a vertical boiler and two vertical cylinders. This model closely resembled the two truck vertical boilered Class "A" models produced by Climax. Another model, Class "B", was produced by the company. These were horizontal boilered units with two four wheel trucks and two cylinders mounted in a "V" arrangement similar to that used by Heisler. An obscure "E" class designation was assigned to a very few of the heavier and larger Class "B" units. All locomotives manufactured by the Dunkirk Engineering Company were referred by the company as being of the "Gilbert" type, for they utilized George D. Gilbert's patents. "Grasshopper" This version consisted of a vertical boiler mounted at one end of a relatively short wooden platform. Toward the center of the platform were mounted two vertical steam cylinders. On the end opposite the boiler, a boxy type of water tank was mounted. Two fixed position axles were mounted below the platform with four wheels attached to these. The engine crankshaft turned spur gears mounted on only one axle. Power was transmitted from this axle to the other via a single side rod (one for each side) attached to cranks on the axle ends. The side rods were outside the wood frame and journal bearings. The wheels were mounted inside from the wooden frame and journal bearings. This power transfer arrangement using side rods was similar to Heisler's one geared axle per truck with the other axle being powered via an out board side rod. Although the short and fixed wheel base allowed easy navigation around curves, the lack of axle or wheel springing probably meant the ride was a rough one. Link and pin coupler pockets were installed on both ends of the platform. The boiler stack protruded through an open, slightly sloping canopy type roof suspended above the platform by wooden corner posts. This provided rudimentary protection of the crew from overhead weather elements. Their approximate weight was 7 - 8 tons. These little fellows were given the name of "grasshopper". These were manufactured only by the Dunkirk Iron Works. The design was of their own and not of George D. Gilbert who was only affiliated with the Dunkirk Engineering Company. This version included a vertical boiler mounted just off center of a wooden flatcar type platform. On the end opposite the boiler was a vertically positioned round water tank. These were sometimes referred to as "pill box" tanks because of their resemblance to the round medical "pill boxes" of the era. Between the boiler and water tank, two vertical steam cylinders were mounted on top of several wood cross beams attached to the platform frame. The platform rode on two sprung arch-bar type trucks which swiveled on a bolster to negotiate curves. Each truck contained two axles to which four wheels were attached. Power was transmitted from the cylinders to a line shaft below the platform. The line shaft ran under the centerline of the platform with each end connecting to a universal joint in the center of the inboard axle of each truck. Both axles of each truck were geared. Like the early vertical boilered Class "A" Climax, a variable speed transmission was utilized. It featured a high, low, and neutral options. Link and pin coupler pockets were installed on both ends of the platform. The boiler stack protruded through the roof of a rudimentary wooden crew cab that provided some protection from the elements. The cab was complete with four partial walls, a few glass pained windows, and a hard canopy type roof. This version was almost identical to the eight wheeled, vertical boilered Class-"A" Climax. They were manufactured using the patents of George Gilbert after the Climax Locomotive Works ceased using this design for one of their own. Class "B" Like the eight wheeled version above, this model also utilized a wooden flatcar type platform, centerline line shaft below for power distribution from the cylinders, and a pair of two geared, four wheeled arch-bar trucks mounted on bolsters. 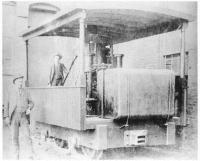 Unlike the Class "A" model, however, the boiler was a horizontal "wagon top" type boiler mounted atop and along the center line of the platform. Just back from the mid section of the platform was a smaller crew cab that covered the back of the boiler and firebox. Behind the cab at the end of the platform opposite the boiler was a horseshoe type water tank and fuel bunker. 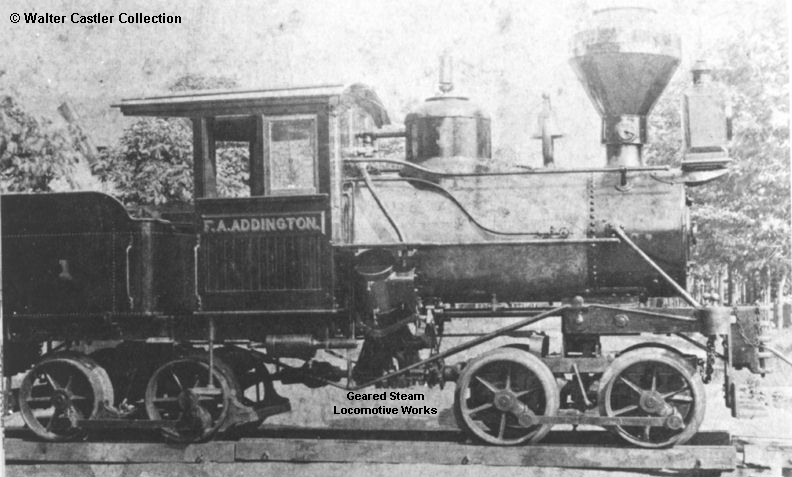 The intriguing part of this locomotive was the location and positioning of the two steam cylinders. 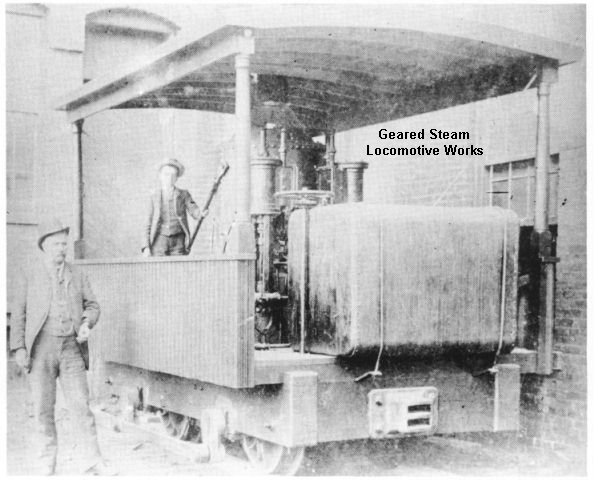 Like the Heisler geared locomotive, this type utilized two cylinders in a "V" arrangement. Unlike the Heisler, whose cylinders were located below the center of the boiler about midway back from its front, the Dunkirk's were located in the cab just behind the boiler and totally hidden from exterior view. The company(s) did not have rail spur to the plant. The locomotives were stored on wood rail (boards) until they were transported to the customer. This fact can be viewed on several of the "builder" photos in these pages. The Dunkirk Iron Works began operations in 1865 in Dunkirk, NY. It manufactured boilers, stationary steam engines, sawmill and tannery machinery, water wheels and items related to all of these. The Iron Works went into receivership on February, 1885 and closed. Two years later, in 1888 the operations were reopened under the new name of Dunkirk Engineering Company by Edward Nichols and three partners. 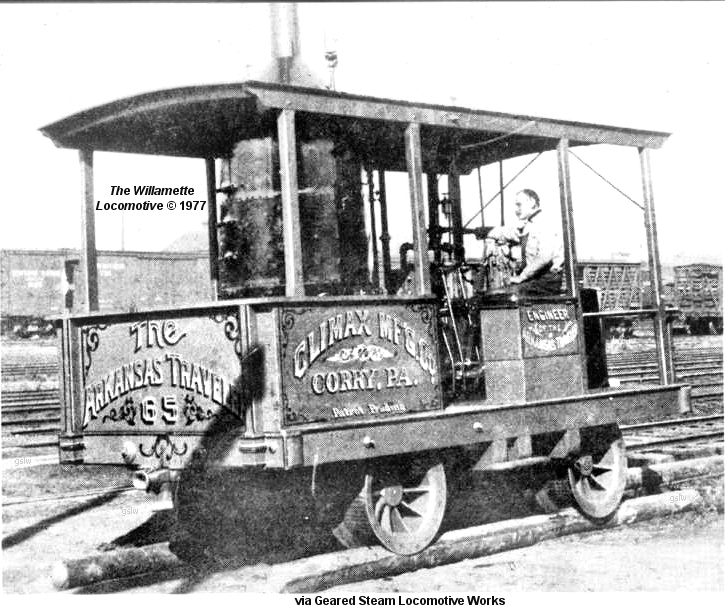 At the time, Nichols was also the president of the Brooks Locomotive Works also located in Dunkirk, NY. Some of the states in which they were Arkansas, Maryland, North Carolina, Maryland, Montana, New York, Oregon, Pennsylvania, Washington, West Virginia and Wisconsin. It is unknown if any were used outside the continental United States. Up to 50 were manufactured. The first 4 wheel Dunkirk Iron Works locomotive was thought to be built in August, 1882. 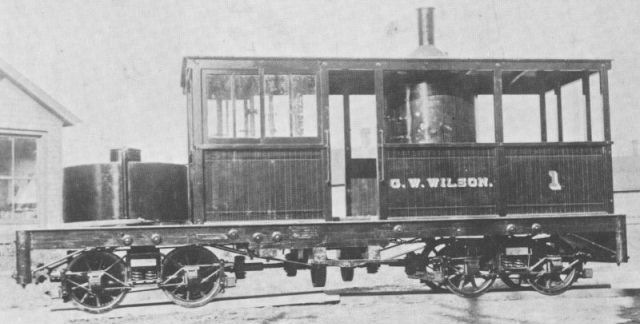 The first "Gilbert" type locomotive, a Class "A", was built in May, 1890. The Dunkirk Iron Works utilized its own design for the manufacture of the four wheeled "grasshoppers". George D. Gilbert held the patents for both the "A" and "B" class of Dunkirk locomotives. He formerly worked at the Climax Locomotive Works where his patents were used by that company to manufacture their vertical boiler Class "A" locomotive. His patented two gear differential was also utilized by Climax on their Class "A" models. Gilbert left Climax when the company stopped manufacturing the vertical boiler Class "A". Charles D. Scott is actually the inventor of the Climax Class "A" (and thus the Dunkirk Class "A") locomotive. Scott, a less educated relative of Gilbert, was unknowingly swindled out of the patent rights to the locomotive, by Gilbert. "Tall Pines and Winding Rivers . . . The Logging Railroads of Maryland" by Benjamin F. G. Kline, Jr.